This portal addresses a variety of people involved in the delivery of eye care. Programs have been custom made for each specialty concerned. 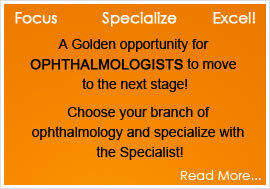 For example: Ophthalmology, Optometry, Ophthalmic Nursing etc. There are structured courses in various subjects. Grand rounds are an important aspect where in once in 7-15 days a new case will be posted on the web along with a discussion. Readers are encouraged to participate in the discussions. The course content is written by experts in each field and contains practical information that is not present in standard text books. The subject is presented in easy to read format supported by pictures and animations where necessary. We hope you can make the best use of this portal and we appreciate your feedback.